Overview. Schools and universities are all about learning - and learning is mostlly brain training. Learning is expedited by repetition and forgetting is expedited by infrequent use of learned skills or information. Tracking the building of the Ravenel Bridge and now tracking the demolition of the Grace and Pearman Bridges bring many questions to me and help me better understand the role Google and the Internet play in just-in-time learning. I enjoy chasing my curiosity and want to identify ways to encourage younger learners to also enjoy curiosity chasing and learning. Many young learners do not understand the importance of repetition. More important, while experienced learners understand the learning process they often do not realize the destructive effects of the forgetting process. Over the course of the bridge project, I have access to only a few experts. Rather than a liability, this has become an asset and pushed me to improve my search skills with Google. Soon, I realized that answers to questions encountered during my photo adventures were often only a Google-search away. Gene Stead, my first boss and I put these ideas together in a small essay: (see Restoring the Joy in Learning). Google + Internet have become dependable extensions of my memory. Insights I gain from you and this project will find their way into the learning centers in our schools and universities. Many of you know that a lot of fun in my day is based on exploring data. I have never understood why data analysis was so much fun - but as long as I can remember, I have enjoyed looking at data, looking for common denominators, looking for the unexpected and then trying to understand the basis of a common denominator or explain an unexpected result. 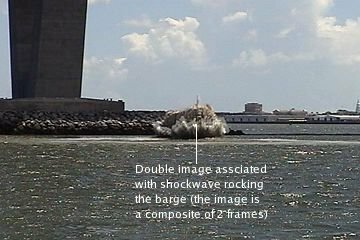 I could detect no double images with the C-2 pier implosion (above two images). What I think is happening is that each video frame consists of two fields, one of the even scan lines and one of the odd scan lines. When processed, the two fields are combined which improves the resolution. One field is scanned every 16.67 msec so I suspect that there was enough movement of the barge between two consecutive frames to produce the double images. 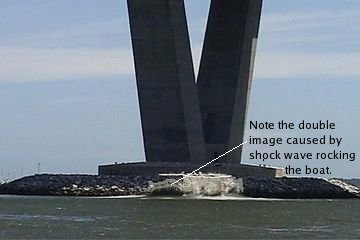 It would be interesting to superimpose the base of the rock island, behind the pier foundations, and see if they appeared to shift up or down between successive frames - paralleling the movement of the barge as the shock wave passed. March 20, 2006 Almost goodbye. One cold morning in January I was watching some girders being erected on Line 14 (the East Bay on ramp) and up drives a car and out pops a man, tripod, camera, hard hat, safety vest - just like me. This was Gary Eaton who had been tracking the bridge longer than I had. During the July transition from building the Ravnel Bridge to unbuilding the Grace and Pearman Bridges, I received some photos from Sparky Witte from Mt Pleasant. Suddenly, the Internet provided two new friends for capturing the behind the scenes story of the building and unbuilding processes. This started our small club of Charleston Construction Photographers - who knows what will happen next? While Gary is a real photographer (visit his Studio web site), Sparky and I were novices and eager to learn. I was very fortunate to acquire additional Internet-initatied contacts that facilitated my learning. Vince Streano from Seattle provided insights about capturing construction photos while Stephen SetteDucati from Boston and did the Big Dig at NIght provided some insights for night photography. While the Internet is a useful communication tool, it is also a tool for social interactions. I would never found Gary, Sparky, Vince or Stephen without the Internet's ability to publish my building and unbuilding stories. As I enter the last few day of acute loose end overload - preparing to depart for Singapore and Duke on Thursady, I am confident that our interactions will continue. Nugget, one of the iron work acrobats has some digital images for our site, Sparky and Gary will continue and I suspect others will contribute. What a wonderful time Ellen and I have had in Charleston and we shall certainly miss it. We are keeping our home and we are keeping all the warm friends that we have made - particularly Tom and Joan Bryce, our neighbors. March 5, 2006: Frank's next chapter. My professional life has centered around the fun of learning and my professional home has always been within universities. Each step of my academic career has been fun and full of surprises - both scientific and cultural. For 32 years I was a faculty member at Duke in the Departments of Medicine (Cardiology) and Computer Science. During this time I was fortunate to stumble on the fun of international collaboration - in France, Germany, Egypt, Spain, the USSR, starting in 1987 in Moscow at the All Union Center for Experimental and Clinical Cardiology. In 1991, I shifted my collaboration to Valentin Krinsky's Autowave laboratory in the Institute of Theoretical and Experimental Biophysics in Pushchino, about 100 km south of Moscow. In parallel, I extended my experiments with other cultures and taught for a year (1993-94) in India (the Indian Institute of Technology, Madras) and more recently (1997-1998) in Greece (where I was a Fulbright Scholar at the University of Patras and most recently, developed a link with the University of Mostar, Bosnia in 2000 and in 2001. Now I am about to embark on another cultural adventure. The Government of Singapore and Duke University have signed a memorandom of understanding to build a new Graduate Medical School in Singapore. I have signed to be part of the new faculty - led by Pat Casey in Singapore and Sandy Williams at Duke. For Ellen and myself, this is a like a trip back home - putting us within a few hours flight time of our friends in South India, Bangladesh and Thailand. I have signed a 3 year contract and will be the Associate Dean for Learning Technologies - a continuation of my career as an engineer in the setting of Medical Education. In addition, I suspect there will be a new Building web site, tracking the construction of the Duke - GMS building. The bridge building and unbuilding web sites will continue. With the members of my former IT Lab at MUSC, we have established a server - Butterfat that will act as an Internet home base for these sites, and those of web page to butterfat ( mine and my IT Lab colleagues). Sparky and the iron workers (Nugget and Speedy) have offered to continue to photograph the progress with unbuilding the Grace and Pearman Bridges. They will send me photos and the stories and I shall try to maintain the continuity of the unbuilding process from Singapore. This will form the core of another Frank Experiment - can we sustain our momentum with participants located half way around the world from each other. In addition, I shall lean on my unbuilding friends at Jay Cashman and Testa - Ken Canty, Ponch Billingsley, Mickey Rogers and Ken Tully at Advanced Blasting Services and the families of Michael Hebb, Richie Bagan and Jack Foley. You cannot imagine how much new life and energy these folks have brought into the lives of Frank and Ellen Starmer in Charleston. I am certain that there will be building and unbuilding opportunities in Singapore and the surrounding area. For example, Oliver Forget (Freyssinet) is now located in Bangkok and is building a new cable stay bridge there. Marvin Tallent is in Pensacola and Peo Halvarsson is in the process of moving back to Sweden. I shall continue to poke these friends and tell their stories. 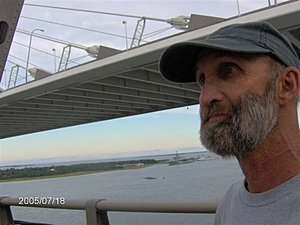 One day as I was following the building of the Ravenel Bridge, I stumbled on a tablet on the top of the west tower that was signed by many of the bridge workers. Hmm, I thought, this is what a signature bridge is all about. Today, though, I discovered another variant of Signature Bridges. Jackie and Richie thought that tonight, they would unpour the last section of Grace roadway at the Mt. Pleasant entrance. So off I went, about 8pm to watch. At 2am Friday morning, it was complete - and - wow, what a new meaning for signature bridge. Jack, Richie,Rich, Roy and myself - the only witnesses to this event. Click for the Grace signature bridge story. Huge thanks to Richie, Jackie, Rich and Roy for the invitation! 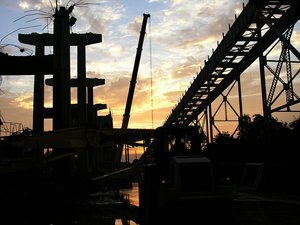 January 29, 2006: Lessons learned from building the Ravenel Bridge. Several people have asked about how these pages got started. This is easy: I started these web pages as a way for my grand kids to follow the building of the Ravenel Bridge. But a number of people are curious about my access to the building site. Several months ago, I as asked this question during a Channel 5 TV interview and I simply replied, "I smile". It was a serious answer. There are two ways to become involved in a project - the front door and the back door. The front door is always obvious and usually opens to a receptionist who directs you to someone. The back doors are usually hidden, but with some practice, you can find the back doors. These doors lead to the men and women that do the building and unbuilding. 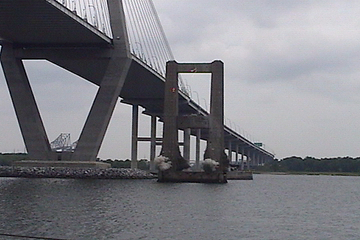 When I started building the Ravenel Bridge web pages, I simply took photos and wrote short photo essays for the kids. I was not looking for either front doors or back doors. But Bill Mankin of High Steel Structures in Lancaster Pa contacted me about the web site - and without knowing it, opened a back door to High Steel Structures. They fabricated the structural steel used to build the main span. David Wertz, then with SCDOT opened doors. Somehow, Olivier Forget of Freyssinet (in Paris) found the web pages and opened another back door and introduced me to the complexity and excitement of cable stay bridges. Then Bill Mankin sent email stating that his team would be in Charleston to drill and ream the splice plate used to join the east and west spans and maybe I would like to watch. Not knowing what to do I phoned PBC and Marvin Tallent answered the phone. I described Bill's request and soon Marvin introduced me to Peo Halvarsson (superintendent of the Main Span) and Wade Watson, who directed the entire project. Bill, David, Marvin, Peo and Olivier became my professors of bridge-ology and through their eyes, I saw and gained insights into the complexity of their project. Because of them, my goal shifted from a grand kids project to one of telling the unseen stories of bridge building. The project ended - Wade returned to Tidewater Virginia, but Peo and Marvin made their way to Pensacola Florida where they are working on rebuilding the causeway (I believe, part of I-10). 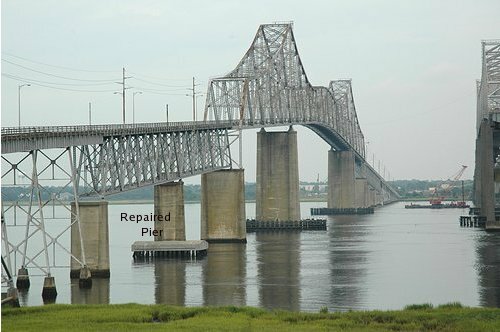 Our friendships have extended beyond the completion of the Ravenel Bridge and a few days ago, Marvin sent me a photo of their project (above) and announced that he had just purchased a new digital SLR camera. Marvin is also a serious cyclist (of the bicycle variety - whereas Wade was a serious cyclist of the Harley-Davidson variety). We are keeping our eyes open for opportunituies to ride together over the Ravenel Bridge. We did this several times before the bridge opened, but that did not count. Somehow, riding together over the completed bridge will provide a nice ending to the story of building the Ravenel Bridge. When the Unbuilding project started - Ken Canty and Ponch Billingsly provided back door access to the Pearman-Grace project. However, the web site, I soon discovered, provided for them a way for their families in Boston and other places to watch their husbands at work. Tina Hebb and Kathy Billingsley were the brave souls that initially encouraged me to engage not only the workers here, but their families there. Their families as well as members of other families (Hal, Joy, Shannon, Corey, Donna-Rae, Joshua) joined the email discussions. Now they are my professors along with Bob McCabe, Pio Monsini, Michael Hebb, Jackie Foley, Neal Meyers and Richie Bagen. Through their eyes I have continue to learn more about building and unbuilding - not just bridges but life. What a learning experience these men and their families have brought to me. The lesson for me is about sharing - first with my grand kids and then with the world. Sharing via the Internet created social contacts that would not have happened without the Internet. The Internet is our new learning tool and for me, adds to the fun of the day. December 15, 2005: Something to think about. A holiday message from Ellen and myself to all of y'all. 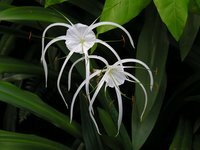 Many folks do not have the possibility to see something that is often somewhat off limits. For me, the opportunity to look over the shoulders, initially of Wade, Peo and Marvin with PBC and now the Cashmen guys, the Testa guys and their subcontractors, specifically Mickey Rogers and his ABS team has been unique. It is appropriate during this holiday season to share with you something that is deeply personal for me. Yesterday, my wife found Unbuilding at Ground Zero and Rebuilding in Iraq and I found it so relevant to the unbuilding story that is unfolding here in Charleston, that I want to share it with you. The essay is an interesting assessment of William Langewiesche’s American Ground: Unbuilding the World Trade Center. The focus of these works is on problem solving - and more important, spontaneous problem solving within the unbuilding trades. I have been impressed, which is an understatement, at the problem solving skills of all the team members that are working on the Charleston Project whether excavator operator, iron worker, burners, supervisors, drivers (whether truck or crew boat) and the engineering staff. Mickey, Pio, John, Neil, Paul, Ken, Joe, Ponch and many many others have provided me with a small look at their world and the daily challenges they face. From time to time, I have pointed out their innovative approaches to a number of problems - at least as seen from my perspective (remember, I am trained as an electrical engineer, so all of this is new to me). When unbuilding something, one does not know what is hiding under the roadbed until it is revealed. I believe successful unbuilders self select themselves because they are really good problem solvers. From my vantage point as a university faculty member, conveying to junior learners the problem solving and critical thinking skills we have acquired over our career is evident in the building and unbuiding trades but, I feel, is often overlooked within our primary, secondary and university educational systems. These guys pass their insights, seemingly effortlessly, from generation to generation. Apprenticeship education and learning by example at its best. As we enter a new era of learning where the Internet flattens our world, makes impossible friendships possible and provides a way for like-minded folks to interact with each other, it seems to me that we need to also take lessons from serious card-carrying unbuilders and develop an understanding of how they transfer their skills to junior learners. It is time for our formal educational system to look critically at how the informal educational system that I have observed within the building and unbuilding community works - and explore ways to strengthen our interactions with our new friends and colleagues. November 25, 2005: The day after Thanksgiving and a time reflection. It is Thanksgiving and most of the Cashman / Testa team has made its way back to Boston while local members have returned to their nearby homes. It is quiet here. Josh (our youngest) and his girlfriend came for Thanksgiving. Ellen departed from tradition, and deboned a huge chicken (10 lbs) for dinner yesterday. Our small family enjoyed a quiet afternoon, wonderful dinner topped by one of Ellen's impossible blackberry pies (the secret is the crust which was passed down from her mother). 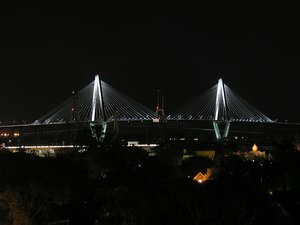 Last night we visited the top of the new MUSC parking garage and found the new Ravenel Bridge quietly inviting us over. To the right was the shadow of the remaining Pearman cantilever section. Just visible, but somehow it fit my mood. Today I took Josh and Bibi for a survey of the bridge work. Bibi is an Art History expert and the interplay of the bridge structures and early morning or late afternoon sun makes for very interesting images. Earlier Bibi looked (probably after being forced by me) to look at a few of the videos I made of our mostly Boston surgeons - and her immediate impression was the care and slow and deliberate way the operators move material from A to B. It was my impression from many months ago. For her to catch it immediately gave me a bit of satisfaction that the photos and videos are, indeed, capturing some of the skillful approach the unbuilding team takes with their work. November 6, 2005: Sunday - a day of rest and reflection. University life restarted in late August. 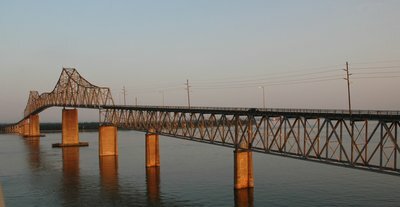 This makes my double life rather hectic - trying to capture the bridge unbuilding during the early morning, late afternoon and evenings. 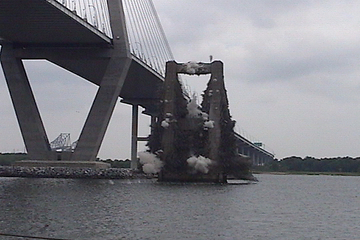 Unbuilding has a rapid pace while building (the Ravenel Bridge) was slower and a bit more predictable. The fast-paced unbuilding, though, has opened new doors for me and brought new friendships. But to track all that is going on - well, its impossible at least for me. But there has been a big surprise for me. With the unbuilding project has come lots of email from wifes, kids and relatives of the Testa and Cashman teams. While I had a little email from the Ravenel families, the Testa / Cashman families have brought a new dimension to these pages. I have to thank Tina Hebb, Maura Bickford (Jack Foley's sister), Donna (Jack's aunt) and Kathy Billingsley for adding this new dimension to our web pages. Kathy is faced with the empty nest syndrome back in Boston with her husband and her 2 "boys" working on the project. From time to time, she reminds me that I missed an update. So the Internet has really flattened our world - and geographic separation does not seem to get in the way of developing friendships between people I have never geographically met. Meanwhile back on the work site, work is mostly 24 hours/day - a 12 hour morning shift and a 12 hour night shift. The teams are dynamic - and some members of the day shifts are moved to the evening shift and that makes identifying teams and meeting them and learning something of their work and life a challenge. I have managed to meet most of the team leaders - Bob McCabe, Neil Myers, Pio Monsini and Paul Leary. Ponch Billingsley seems to have his fingers everywhere and is moving from site to site, along with Steve Testa - sort of roaming symphony conductors who refuse to remain standing on a single platform. Moreover, Joe Duffey and Ken Canty are into everything. One afternoon I was watching Mike Hebb hammer away at a Pearman column (at the Port) and Joe walks up and we talk about what is happening. Later that night I found Jack Foley and Roy Delpriete segmenting concrete girders. Joe was there also. Early one morning (about 4am) I caught some of the cleanup from removing roadway over the East Bay ramp to the Ravenel bridge. Then about 10 that night I was watching Neil's team pick up the concrete girders over the East Bay ramp. Each time I ran into Joe. And Ponch was multi-tasking - directing traffic, running a front loader (to set up for the 7550) - you name it, these guys are all over it. They truly reflect a highly skilled surgical team that is continuously fascinates me. No boring jobs here - there are always surprises. But my memory is a problem. Recently I renamed Chris Vocci as Cecil - who runs the 7550 giant crane. Earlier I mixed Jack Foley and Michael Hebb. These guys and/or their families quickly point out my errors and so, help improve the accuracy of this story. Recently I met Mickey Rogers whose Advanced Blasting Services is responsible for the concrete explosive work. Mickey has become another of my professors and helped me to understand the preparation of the columns for explosive removal. As the project moves into its explosive stage, I shall bring more of the insights from these teams - as they teach me something of their art. 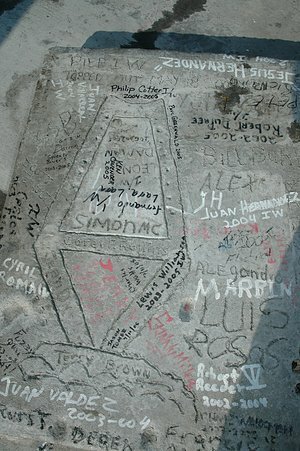 September 19, 2005: Another kind of construction, reconstruction and demolition. From time to time, I have experienced a convergence of events that can, by no means, be a coincidence. Last Thursday I visited friends that were my PhD students while I was a Fulbright Scholar at the University of Patras in Greece. As husband and wife, life is a bit strained at the moment with one working in Patras and the other working as a Post doctoral fellow in the Physics Department at the University of Potsdam, German. Potsdam is just outside Berlin and so I spent the weekend with them in Berlin. Friday was raining so we spent it at the University. Saturday was blue sky everyone with cotton puffs for clouds. 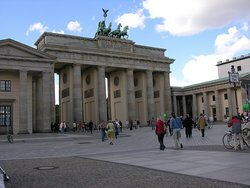 I had two requests - to visit the Brandenburg Gate and to visit the Wall. The story goes like this. In November of 1989, a colleague from the University of Freiberg. During dinner we discussed as a family, what was happening in Eastern Europe. Each day, stories of trains of refugees passing through Hungary and into German became stronger and stronger. 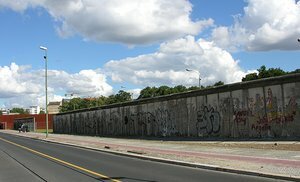 I asked my friend, what about the Berlin wall - will it ever come down. Without hesitation, he replied - "not during my life". Later we turned the TV on and watched the evening news as the Berlin Wall was coming down. So to visit Berlin and not touch the wall - impossible. 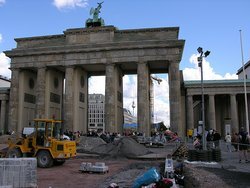 As you can see, there is construction in Berlin, reconstruction and memorials of past structions designed to contain and restrain interactions among free people. 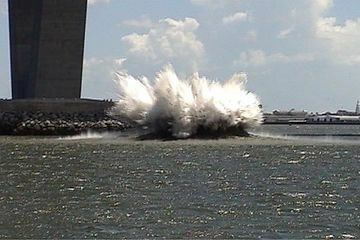 the piers, you might take a close look at the footing of that first pier." And just to keep life interesting - here is today's projection of Hurricane Ophelia. Ophelia has been just sort of chillin' out a bit - about 150 miles east of Charleston. NOAA provides a very useful service with their projections and advisories. 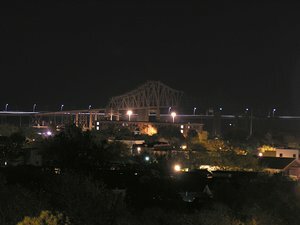 I've included these on the main bridge web page. We have a more compresensive aggregation of weather related images at MUSC. I suppose I always thought that demolition was just another destructive process - that of removing components until all the structure was reduced to a pile of rubble. Was I ever wrong. Watching and talking with the Testa and Jay Cashman guys, I have found that there is skill, precision and a bit of art in their work. Skill to work the giant grapples, jackhammers and shears. Precision in removing segments of the road, cleaning the underlying I-beam surfaces (on the Grace and Pearman bridges) or cutting the rebar that formed the concrete supporting structures along the Grace and Pearman approaches and exits and art - somehow instinctively knowing what and where to apply their what I call, surgical tools. 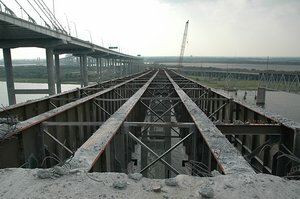 Just as I learned of the precision (fractions of an inch) required to join the edge girders of the new Ravenel Bridge, I have learned from the Cashman and Testa workers that unbuilding requires similar precision. I was trained as an electrical engineer - where precision was part of the discipline. I suppose I was quite guilty of looking at my civil engineering colleagues as working with precision that was less demanding and "close enough for highway work". Was I ever wrong! I have totally reversed my understanding of demolition over the short month since the demolition of the Grace and Pearman bridges and approaches started. Another demonstration that even at my age (64 next week) - continued learning is possible and even necessary. Sparky Witte, a long time resident of Mt. Pleasant, grew up with the Grace and Pearman bridges. With the Ravenel bridge he has enjoyed being able to walk and bicycle across the bridge, admiring Mt. Pleasant to the east and Charleston to the west. He also can watch the unbuilding of the Grace and Pearman bridges. Last night, Sparky sent me a group of photos of the July 30 events - the race and the old car parade. Moreover, he had taken quite a bit of time to track the demolition of the I-26 and Meeting Street overpasses. I was unable to stay for all the I-26 work Sunday morning and missed completely the Meeting Street overpass demolition. So here is part of Sparky's gift - a group of photos that provided timely tracking of the unbuilding process. I have added the Meeting Street work to the main page (tracking the progress over the past days) as well as to the Meeting St. page. 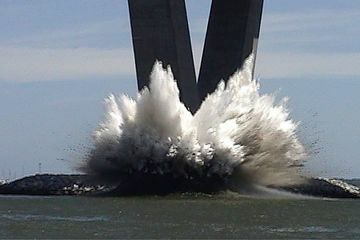 His photos of the extraction of one set of supporting piers (and cap) as been added to the Engineering Challenges page. Among his photos was one of him - posted above. Clearly, Sparky has brought new life to our web page, adding photo input to the engineering input I receive from many people. Sparky - you're the greatest! During the construction of the Morrison Street on-ramp, bicycle and pedestrian walkway, there was an obstacle at the base of the Pearman bridge. A vertical support structure prevented paving a small section of the bicycle lane. A small wooden platform was built around the Pearman supports - a sort of detour. With the demolition of the Pearman and Grace moving ahead (briskly), I understand that this platform will be removed when the vertical supports are removed, then bicycle lane paving will be completed. But what a perfect spot to place a few park benches so that walkers can stop, rest and contemplate not only our wonderful bridge, but life, the universe and everything. So what about this option, is it possible to modify the contract with Cashman-Testa to not remove the wooden platform and for the City to populate it with a few park benches - particularly useful to maturing adults (age > 60)? August 11, 2005: A little weather and a little web page design. During the construction of the Ravenel Bridge hurricane cables were installed to provide some lateral stability under high wind loads. 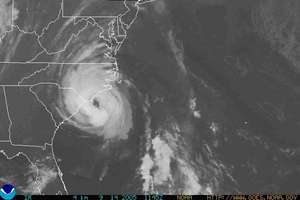 At the same time, I was exploring how to harvest weather data from NOAA and the National Hurricane Center so that MUSC faculty, staff, students and worried parents of students (and perhaps worried parents of faculty / staff) could view primary data without visiting multiple web sites. The National Hurricane Center in Miami provides RSS (Rich Site Summary) feeds that are small, Internet accessible, data files that include links to weather advisories and storm projection graphics. From these links we wrote a short script to periodically download the updated advisories and satellite imagery and storm projections. Our MUSC site presents this and other harvested data on a single web page. I learn by example, so I copied Satya's example, adapted it to our bridge page and after 1 mistake (mine) - it works. While I always understood that building required more time than unbuilding I never really felt the difference. Tracking the construction of the Ravenel Bridge, in retrospect, was a leisurely activity. Tracking the demolition (I prefer unbuilding) of the Grace and Pearman structures (bridges as well as approaches) is turning into a twice daily affair - early morning (6am) and early evening (6pm). I'll keep this schedule as long as possible. 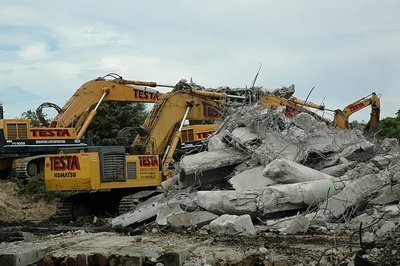 The folks at Jay Cashman - Testa have been fantastic and helped me understand not only the demolition process but the sequencing required to manage demolition without shutting Charleston down for 6 months. 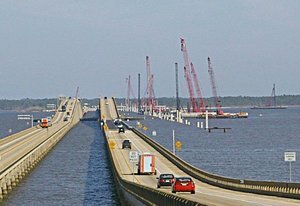 The construction of the new Cooper River Bridge is complete. The fireworks and opening ceremony, from my perspective, breathed new life into our community. Certainly use of the bicycle and pedestrian walkway during the first days demonstrated both their utility and the vision of the bridge sponsors. There is a first chapter and a last chapter with every story and our bridges are no different. I have started preparations for keeping our stories alive, now as historical documents. 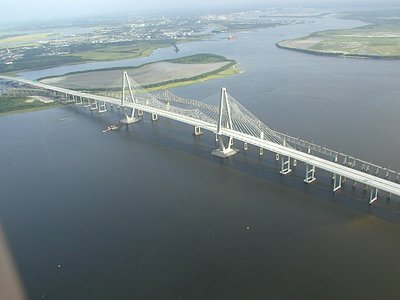 As a first step, I am moving the Internet address of the Ravenel Bridge story to http://ravenelbridge.net. This will provide a stable location and facilitate transition of the site to a future home, perhaps the Charleston Public Library or the Historical Society. I have not explored this with any agency, but it seems to me that our web site (yes, not mine) would be better preserved under the leadership of a public agency. Yesterday I started the first chapter of the unbuilding of the Grace and Pearman bridges. I have moved the Internet address for our new story to http://oldcooperriverbridge.org. I shall continue to take weekly, and in some cases, daily (early morning and late afternoon) photos of the Charleston approaches, Mt. Pleasant approaches and the main bridge spans. In addition, I will build a new section addressing engineering issues and insights, similar to the Engineering and Close-ups section I developed around the construction of the Ravenel bridge. Many of you have fed me ideas and questions. As we start our new story, please continue to write me. Let our learning continue!.